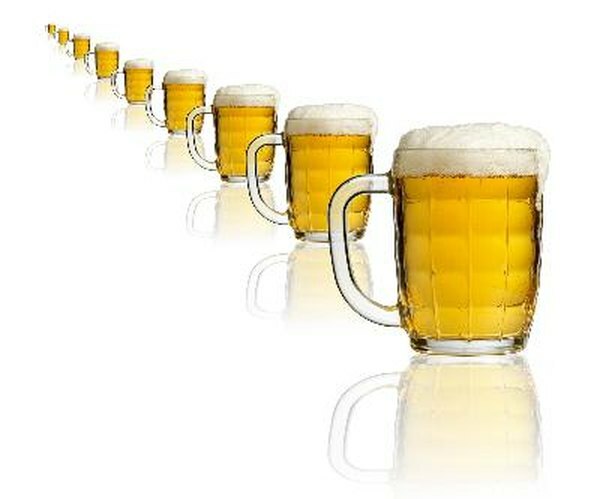 In 2012, Americans consumed more than 200 million barrels of beer, according to the Beer Institute. When it comes to diet and balancing calorie intake, beer calories count. If you want to maintain a healthy weight, you need to balance the number of calories you consume with the number of calories you burn. Knowing how many calories your favorite bottle of beer contains can help you adjust your intake. Moderate drinking is safe for most adults, says the National Institute on Alcohol Abuse and Alcoholism. Men can safely consume 24 oz. of beer a day, and women can drink 12 oz. a day. However, if you are under the age of 21, pregnant, need to drive or are taking prescription or over-the-counter medication, you should not drink any alcohol at all. Domestic regular beer is brewed in the United States and includes brands such as Anheuser Busch, Adolph Coors, Blatz, MillerCoors and Pabst. A 12-oz. serving of Anheuser Busch's Budweiser contains 145 calories, Bud Dry has 130 calories and Bud Ice has 123 calories. A 12-oz. serving of Adolp Coors Blue Moon contains 171 calories. A 12-oz. serving of Blatz contains 153 calories. A serving of MillerCoors Miller Genuine Draft contains 143 calories. A serving of Pabst Blue Ribbon contains 153 calories. The domestic beer with the highest calorie count is made by Sierra Nevada. Its Sierra Big Foot has 330 calories in a 12-oz. serving. A domestic light beer contains one-third the calories of the original. A 12-oz. serving of both Bud Lite and Miller Genuine Draft Light contains 110 calories. Miller Lite contains 96 calories per 12-oz. serving. Many domestic brewers also offer even lower calorie beer choices, including Miller Genuine Draft 64, which has only 64 calories per 12-oz. serving. Budweiser Select made by Anheuser Busch makes the lowest calorie beer, with 55 calories per 12-oz. serving. Imported beer comes from all over the world, including Holland, Germany, Scotland and Canada. From Holland, Heineken Lager contains 150 calories in a 12-oz. serving. Germany's St. Pauli Girl Dark also contains 150 calories. Molson Golden Beer from Canada contains 170 calories. Scotland features the highest calorie imported beer, with 295 calories in a 12-oz. serving of its McEwans Scotch Ale. Many beer imports also offer a light version. A 12-oz. serving of Heineken Special Light contains 99 calories. Molson Light contains 82 calories per 12-oz. serving. Beck's Light from Germany is the lowest calorie imported beer with 64 calories per serving.